Titan Paracord is made from 100% Nylon, measures 5/32″ in diameter, and contains 21 individual strands, braided into seven seriously-strong 3-strand yarns. Its official military designation is MIL-C-5040H, Type III, 550 Paracord. Titan Paracord is the ultimate utility cord, and is also known as 550 Cord, Parachute Cord, or Survival Cord. Our exclusive Survivorcord design incorporates Titan’s trusted Military 550 Paracord with 3 extra strands for extreme survival situations: a strand of strong fishing line, a strand of waxed jute, and a strand of light-weight copper wire. Cordage… One of the “Five C’s of Survivability” is important to keep close at hand for so many reasons. One of the more popular is Paracord, but even paracord comes in all flavors. Titan Paracord has come out with a new type of cordage that integrates their well-known Mil-Spec 550 Type III Paracord with monofilament, copper wire and waxed jute adding even more functionality to an already terrific product. Whether you need to make a shelter, a splint, a satchel or one of a million other uses, having sufficient cordage can make all the difference. Length, tensile strength, and flexibility are the three main qualities to good cordage. As a result, there are many schools of thought on what cordage should be carried. Survivalists often carry a 120′ spool of #36 Tarred Bank line which has a tensile strength of 348 lbs as their cordage. 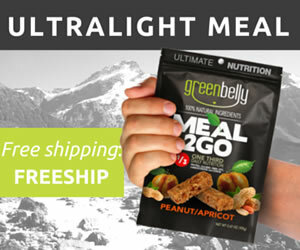 It is compact, lightweight and very strong. Others carry a 400′ spool of #12 Tarred Bank line which has a tensile strength of 100 lbs in addition to a length or two of paracord which has a tensile strength of at least 550 lbs for those tougher jobs. Genuine MIL-SPEC MIL-C-5040H, Type III, 550 Paracord is made from 100% Nylon, measures 5/32″ in diameter. It has 7 to 9 inner yarns each made up of 3 strands. Parachute cord (AKA paracord or 550 cord when referring to type-III paracord) is a lightweight nylon kernmantle rope originally used in the suspension lines of parachutes. The inner yarns each have a tensile strength of 50 lbs for a total tensile strength of 350 lbs. It is then covered with a durable sheath adding 200 lbs of tensile strength for a total minimum tensile strength of 550 lbs. In addition to its impressive strength and functionality, the attraction to paracord also has to do with the many ways it can be used. If you deconstruct it, you get a cord with a 200 lb tensile strength and 7-9 smaller cords, each with a 50 lb tensile strength. These could be great for making a hammock or building shelter. You can even take it a step further resulting in 21 tiny strands, each with an approximate 16 lb tensile strength. This could be good for fishing line or making a gill net. Titan Paracord is a trusted manufacturer of high-quality paracord used by U.S. and Canadian Defense Forces, the U.S. Coast Guard, and outdoor enthusiasts around the world. Their paracord comes with a 100% satisfaction, no hassle, money-back guarantee. It arrives bundled securely with a TITAN ParaCord keeper with the ends finished cleanly. Recently they have taken the functionality of paracord to a whole new level with their new product. Survivorcord is a patent-pending marriage of their flagship paracord product with a strand of monofilament fishing line, copper wire, waxed jute. Survivorcord weighs only 2.6 ounces per 100′ bundle more than their standard paracord and the additional thickness is barely noticeable. However, the additional rigidity of the cord definitely is. The flexible monofilament line is a 24 AWG transparent fishing line with a 25 lbs test. Perfect for those emergencies when you need some to do some fishing, binding, or sewing and you don’t have any other resources available. The strong malleable copper wire is a 30 AWG plastic-coated solid-core wire that is very flexible. Great for making snares and conducting electricity. 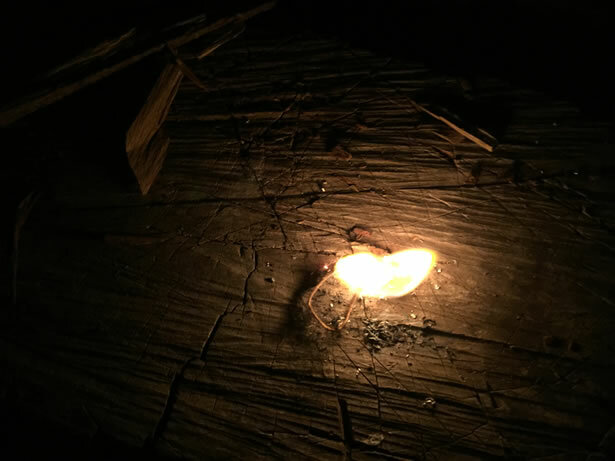 The waxed jute is a waterproof thinly-woven yarn of flammable waxed jute fiber for use as a fire-starting tinder. Simply mash it up and spread the fibers before dropping some sparks in it. First of all, Titan’s Survivorcord is NOT able to withstand the extreme torture provided by my 11-month-old retriever pup. She apparently decided to help me out with the testing when she took off with the bundle of Survivorcord that I had on my desk. Needless to say, I now have a 50′ bundle and a few smaller pieces left… Maybe I’ll try making some new neck knife lanyards out of them. For the strength test, I had no doubt that the paracord itself would withstand 250 lbs jumping up and down on a length of cord strung between two trees. What I was really interested in seeing was how well the monofilament, copper wire and waxed jute would survive any kinking near the knot locations and the stress of tethering under load across a distance of 10′. After a few minutes of stressing the line, I untied the knots and began pulling the monofilament and copper wire out followed by the waxed jute. I figured that the the waxed jute would be the weakest material and thus the most difficult to get out in one piece so the extra room provided once the monofilament and copper wire had been removed made go much easier. However, it was not easy… It would have been much easier pulling it out of shorter pieces sections of cord. Surprisingly, the three strands that I had pulled out were not broken or severely damaged in any way. Additionally, the cordage that remained completely intact was flexible, fully functional 550 paracord. Short of putting the monofilament and copper wire through practical application testing, I found them to be very strong and accurately described in the Survivorcord specifications. The monofilament shared a relative diameter and composition to other monofilament that I had on hand. With the copper, I made a makeshift snare and tested the strength with a stick. The wire is easily strong enough to snare small game with ease. As for the waxed jute, I did try performing a practical test. First, I used the pommel of my knife to flatten and spread the waxed jute fibers before pulling them apart. Once I had approximately 3″ of jute frayed and bundled into a loose ball, I used a ferro rod to ignite it which burned up far too quickly. The second time I tried it, I used a 6″ piece and only frayed the last 1.5″. This time, it stayed lit much like a candle for almost a full minute. Plenty of time to add more tinder and get the fire going. After playing around with Survivorcord for a few weeks, I found it to be a decent alternative to standard paracord in many cases, but surely not all of them. While it is only 2.3 ounces heavier per 100′ bundle than standard 550 paracord, it is not nearly as flexible and it is quite a bit more expensive. Not to mention, it is currently only available in one color, bronze. 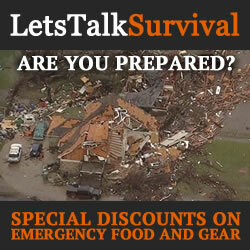 I think Survivorcord is a real winner when it comes to multi-functional survival products. It is a superior form of emergency cordage… Not something that you would likely purchase just to go fishing, trapping or to start a fire. It is however perfect for use in belts, bracelets, neck lanyards, wraps and other gear that are always close at hand, but you would likely only tear apart in the event of an emergency. I know… I’ve already added a chunk of Survivorcord to each of my bags, and replaced most of my neck lanyards and handle wraps with it. Now if someone would only produce a nice Survivorcord belt, I’d likely get myself one of those too. 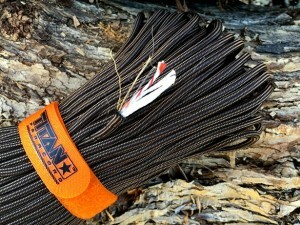 Titan™ Paracord is a small, veteran-owned, business located in Central Valley, California. Jarod King, the owner, is an 8-year Army Infantry combat veteran, and an expert in the use of 550 paracord in outdoor activities such as camping, boating, hiking, and rappelling. After years of buying inferior paracord claiming to be “mil-spec”, Jarod decided to start his own company to serve the more discriminating military and veteran niche where tactical applications requiring strength, durability, and safety are needed. We are now a trusted global supplier of genuine 550 paracord, as well as commercial paracord and paracord-related products. Titan’s broad portfolio of market-leading products helps our customers feel safe and secure when engaging in outdoor activities. In addition, our continuous innovation and delivering on commitments allows us to provide our customers with high-quality products, at competitive prices. 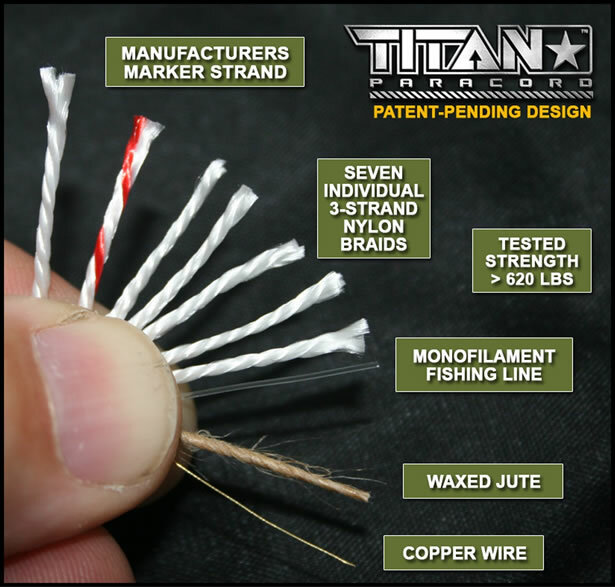 While Titan™ Paracord is what we like to call “Titan Tough™”, it can still be used for less-demanding purposes such as crafting and general utility line use.